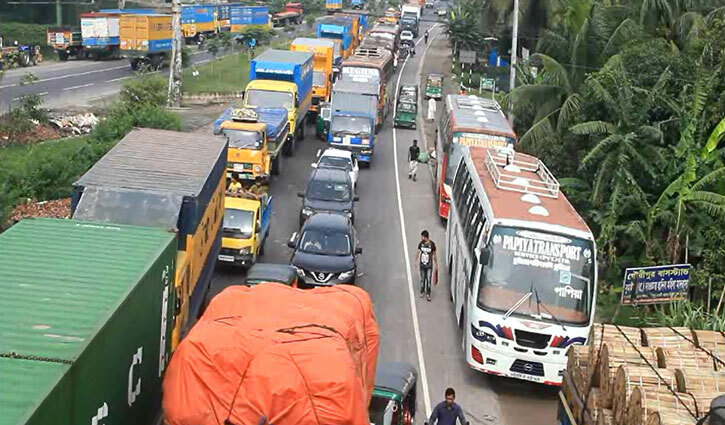 Cumilla Correspondent: A five-kilometer tailback has been created on Dhaka-Chattogram highway in Cumilla. The long tailback ensued from Daudkanadi toll plaza to Shahidnagar. Though vehicles were moving slowly since Thursday night, traffics came to a halt on Friday morning. Thousands of passengers have been suffering immensely as hundreds of vehicles got stranded on the highway. Goods transportation also disrupted as many of carriers got stuck in the tailback. Abul Kalam Azad, Officer-in-Charge (OC) of Daudkandi Highway Police Station, confirmed the news. He said, “Vehicles are moving slowly as construction works are running at link road of the eastern part of Meghna Bridge in Munshiganj which created tailback on the highway.